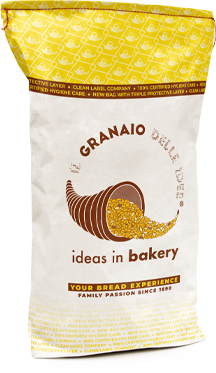 Characterized by venus rice, which originates from an ancient variety of black rice from China, this bakery mix gives the bread a pleasant fragrance, a special scent and a balanced flavor. Nucleo® Riso Venere embellishes bakery products with an elegant, warm and particular colour, with violet hues. Natural and clean label Nucleo®. Excellent for making exquisite croissants. The nutritional claims refer to the bread made from this product according to our recipe. Subscribe to our newsletter and stay informed about news, promotions and events every month! Il Granaio delle Idee s.r.l. Do you need more information about Pane Funzionale Salus®? Fill in the dedicated form with your request and you will be contacted as soon as possible. Enzymes used by Il Granaio delle Idee are the result of an accurate selection, in compliance with current food legislation and in the name of naturalness and quality. The company is specialized in the use of enzyme technology in the field of bakery improvement. Our innovative enzyme blends allow us to solve the critical issues typical of the world of baking and pastry, always considered difficult to solve without the use of emulsifiers or raw materials of chemical origin. In collaboration with our customers, our Research & Development Laboratory studies customized enzymatic improvers to achieve challenging goals and solve their production problems. Our natural improvers are obtained using non-standardized concentrated enzymes: this allows to obtain highly competitive cost-recepts on the market. Il Granaio delle Idee proposes enzymes with single activities and different concentration levels or customizable on customer request. Our range includes enzymes of both fungal and bacterial origin, including: Amylases, Lipases, Glucose Oxidases, Hemicellulases, Proteases, Transglutaminases. Choose the features you want to improve in your bread: we will create for you naturale customized products, with high performance and low cost.